The readers of my blog will know that I am very supportive of the latest actions from the Czech central bank (CNB) to start to use the exchange rate as a policy instrument given the fact that interest rates effectively are stuck at the Zero Lower Bound. However, I think much more is needed to pull the Czech economy out of the quasi-deflationary state it presently is in and has been in since 2008-9. The most important thing is to work on communication and more specifically on forward guidance. So while the CNB got it right when it last week announced a “floor” for EUR/CZK and effective devalued the koruna by 4% the CNB has failed to spell out its “reaction function”. The CNB has said it will maintain its 27-floor on EUR/CZK until inflation is back at 2%. However, the CNB did not spell out what it would do if the announced policy would not be enough to lift inflation back to 2%. The CNB seems to think that the policy it has announced is enough to increase inflation to 2%, but there is no guarantee that that would happen. In fact I think it is not enough. The problem is that the CNB has not made it clear enough that if it does not hit its targeted inflation rate of 2% it will act again. Obviously it has not ruled this out, but one get the impression that the 27-floor is “fixed” – not only on the downside (appreciation), but also on the upside (depreciation). If the CNB had clearly said “We will evaluate progress in ensuring our policy objectives and if we are dissatisfied with the progress we will not hesitate with moving the floor for EUR/CZK up again”. That I believe would have helped the CNB convince the markets that they mean business and even more important it would seriously reduce the need for actual currency intervention as weak macroeconomic data on its own would move the koruna weaker in anticipation that CNB could again intervene to weaken the koruna. Since 2009 the CNB has more or less consistently undershot its 2% inflation target. With its “new” exchange rate based monetary policy the CNB will not do anything to “undo” past mistakes or said in another way the CNB will let bygones-be-bygones. The result is that the CNB’s monetary stance remains too tight – also after last week’s policy changes. 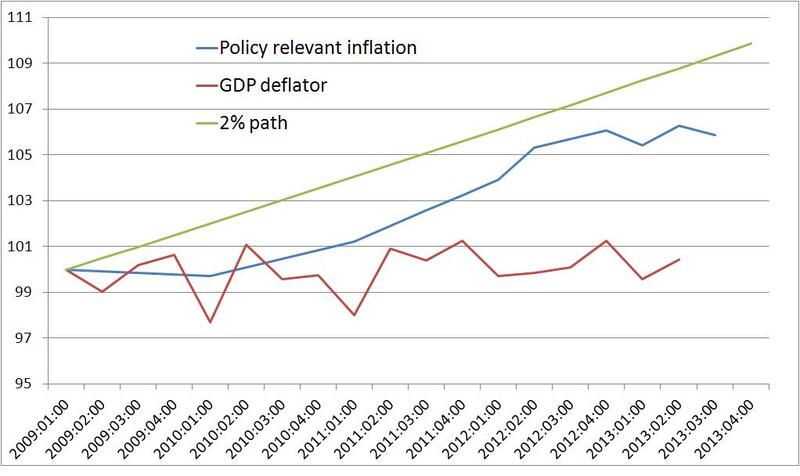 The graph below shows the price level in the Czech Republic compared to a hypothetical 2% growth path starting Q1 2009. The green line shows what the price level would have been had the CNB kept prices rising by 2% year in and year out. Overall the price level would have had been around 10% higher today than in early 2009 if the CNB had indeed kept its promise to ensure 2% inflation. If one compare this to the CNB’s prefered measure of inflation the so-called monetary policy relevant inflation (MPRI) then we see the price level is around 4% too low compared to the 2% growth path. And it is even worse if we look at the GDP deflator – my prefered measure of demand-driven inflation. Hence, the GDP deflator has been basically flat for the past five years – so the level of the deflator today is around 8-9% below where it should have been if the CNB had targeted a 2% growth path for the deflator. One can always discuss what measure of inflation the CNB should target, but both the MPRI and the GDP deflator show that monetary policy consistently has been too tight over the past five years. This in my view is a very strong argument why the CNB’s recent actions are fully justified. In fact the rather large undershooting of the actual price development in my is an argument that the CNB should act even more forcefully. The best way to act aggressively to bring the the Czech economy out of the present quasi-deflationary state would be for the CNB to announce a level target for prices in the Czech Republic, which will undo the failures of the past five years. Hence, the CNB should announce that it will close the gap between the actual price level and the “targeted” price level (the 2% path) within for example the next two years. That might not seem like a lot, but it would actually neseasitate an nearly 10% increase in the monetary policy relevant price level over the coming two 2 years. That might seems to be a lot, but it is on the other hand an illustration of just how big CNB’s deflationary mistake has been over the past five years and in that perspective it is hardly a surprise that the Czech economy basically has been in recession for the past five years. To achieve an ambitious price level target the CNB also needs to demonstrate that it is willing to act. It has taken the first step, but the CNB needs to act even more bold. It needs to set a price level target and it need to announce that it will step up monetary easing further by moving the EUR/CZK floor up (devalue) again if needed. Finally, CNB chief Miroslav Singer has been criticized by some in the Czech media for his policy announcement last week and it the policy has been discribed as highly inflationary. However, I find this critique totally unjustified. Czech monetary policy has been extremely tight over the past five years. Last week the CNB took a small step to take the Czech economy out of the deflationary trap, but it is indeed a very small step and without additional policy measures (primarily better forward guidance) the CNB is likely to continue to undershoot its 2% inflation target. Miroslav Singer dared to take the first step. Now lets hope he will take the additional steps needed to end the deflationary crisis in the Czech economy. See my previous post on CNB’s policy action here.